Atherosclerosis may involve peripheral arteries, particularly the leg, starting from the iliac arteries and extending to femoral, popliteal, and lower leg arteries. 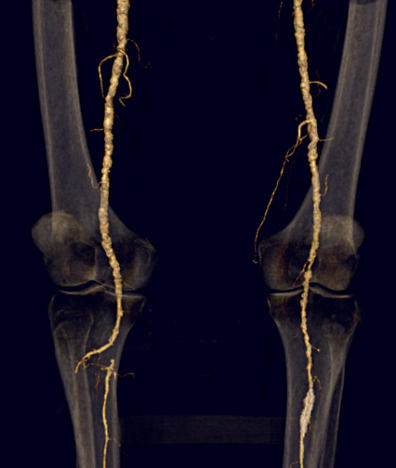 Shown here with CT angiography is an occlusion of the right popliteal artery. There is runoff into a collateral arterial branch. Complications include reduced exercise tolerance, pain, and ischemic changes that can culminate in gangrenous necrosis. The ankle-branchial index (ABI) can document peripheral vascular disease and is measured with a manual blood pressure (BP) cuff and a Doppler ultrasound device. With DU the systolic arterial occlusion pressure is measured, first at the level of the brachial artery in the arm, then at the level of the ankle. ABI is the ratio of ankle occlusion pressure to brachial artery occlusion pressure. The ABI should normally be 1.0. An ABI below 0.85 is consistent with PAD. Another measure of peripheral vascular disease that performed along with ABI is pulse-volume recording (PVR) of volume changes that occur with arterial blood flow into the leg. PVR is performed by placing multiple pressure cuffs along the thigh, calf, ankle, and great toes. The cuffs are inflated to 40-60 mm Hg. Changes in the volume in the leg correlate with changes in pressure in the cuff that are recorded via a transducer over time.